The State of Grace by Rachael Lucas was a book that was talked about quite a lot a few months ago. I kept reading tweets or emails saying how much fun the main character is, how I'll fall in love with her, how others already had. And I admit it, I fell for that hype. I wanted to meet Grace and see if she was everything I wanted her to be. 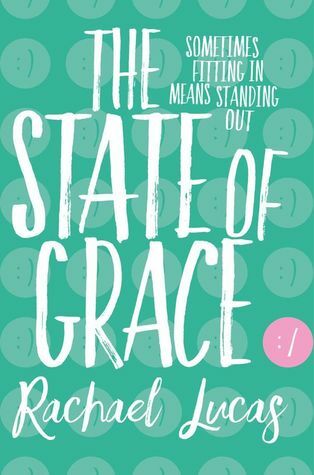 I think the thing that most drew me to The State of Grace is that this an #ownvoices book featuring autism representation and that was something that I was very excited about. However, while I'm sure the representation of autism was pretty good ... I just didn't really connect with the story or with Grace as a character, unfortunately. I wanted to love the story more than I did. But as disappointing as it is to admit, it was just okay for me. This book follows the main character, Grace, during a rather chaotic time in her life. Everything seems to be going well, until everything suddenly isn't. Things are difficult at home with her father away on a business trip and her mum acting a little bit strangely. She ends up kissing a boy, Gabe, and her sister is going off the rails a little bit. And Grace has Asperger's and sees the world differently to everyone else. I think the author did a great job in letting us as readers know what Grace needs in terms of managing her autism with structure and routine because of how overwhelming life becomes for Grace. She also does a great job in depicting Grace's parents. Her mum in particular bears the brunt of being the person responsible for making things better for Grace but that responsibility comes with its own price tag. I also really liked Grace and Gabe as potential love interests. Both are a little bit sweet and awkward which makes them both all the more endearing. I wish I could explain in words better why this book didn't work for me as I wanted it to? It was fairly quick to read, it had aspects of the story line that I really enjoyed. However, that spark that I was expecting from this book just wasn't there for me, personally. But that's just me. Perhaps you'll love this book as much as the dozens of other readers and their reviews that I've seen. I hope you do. Hm. I suppose it may be a bit difficult to connect with a character with autism? Considering it's an #ownvoices... maybe? I don't know. I'd have to read it for myself to find out where I stand, but anyway, good on you for giving it a go and glad that you liked some aspects of it particularly the representation of it.